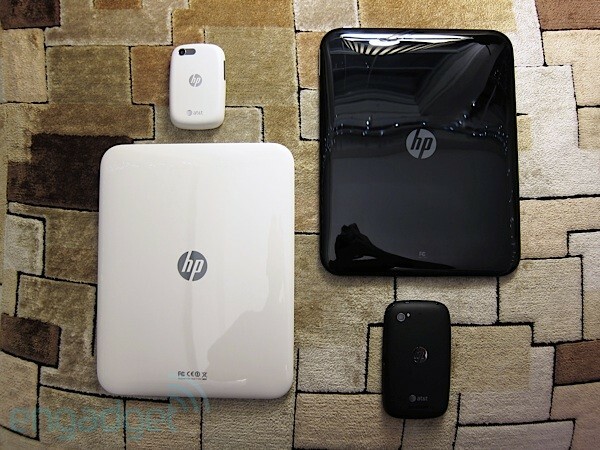 Our friends at engadget have been able to uncover some of HP’s unreleased WebOS products. In the photo below you can see the white European TouchPad, the black TouchPad 4G for AT&T. Not to mention the Pre 3 4G for AT&T phone and the Veer 4Greview unit. At engadget they were able to play with all of these devices but were not able to use the software. The white TouchPad which is a 64GB model is faster than the black version with a 1.5GHz CPU. AT&T’s TouchPad 4G comes with 32GB of internal storage with a working SIM slot and can work with HSPA+. Though it is mainly the same as the WiFi version. Check out the picture below to see these devices for yourself.